A few days ago, Hilary Mason, a data-mining engineer at N.Y.-based, URL shortening service, Bit.ly, made news for her attempts at creating a smarter email inbox that kept the important and urgent messages ahead of what are messages of less importance. Some of us eager for Ms. Mason’s creation might have a near-term solution to handling the backbreaking load of email, thanks to Google (s goog) and the engineers behind the Gmail team. The company today is launching a new feature (in beta) for its popular Gmail service — Priority Inbox — which uses machine-learning technologies and marries them to Google’s search capabilities. Keith Coleman, the Gmail product director who’s been working on the product since its birth, explained that Gmail watches for things like who’s sending or receiving messages and if those people are in your contact list, then looks at other elements, such as whether the item might be spam and if the messages belong to a mailing list. It also peers into headers to make better sense of the message and give it more context. The Priority Inbox allows important emails to surface and stay up top, pushing the less relevant stuff into the background. When the Priority Inbox fails, well, you can train it by using the +/- buttons that are part of the new menu. Now, I’m not a big fan of web-based email. I prefer the comforts of Mail.app desktop software client. By using a combination of rules, smart mailboxes and some specialized and custom scripts, I’ve beaten my email inbox into submission. It’s not that I have much of a choice; with over 1500 emails a day, I’m at risk of losing important messages, as well as spending too much time on irrelevant stuff. My email system is admittedly held together by the proverbial Band-Aid, but for me it works. Nevertheless, for the past three days, I’ve been forcing myself to use Google Apps’ web interface, with Priority Inbox turned on. The feature is impressive and fantastic, and works as effectively as Google’s spam filters. In fact, it works so well that you almost forget it’s still in beta and hasn’t been a standard feature. Google’s been testing it internally with 10,000 Googlers and few non-Googlers. The feature has impressed me enough that I’m considering abandoning my own methodology in favor of this web-based marvel. “What we want to do is give people some of their time back and with this new product we are starting to make a dent, “ Coleman said. We need help: According to research firm The Radicati Group, a typical corporate user sends and receives about 110 messages every day, while nearly 294 billion emails are sent every day. The average number of corporate emails sent and received per person per day will climb to 228 before 2010 is over. Those are some scary statistics, especially because email is now supplemented by even more data sources like Facebook and Twitter, only adding to what has become the new malaise: infobesity. Gmail is off to a good start! Priority is critical in a world of information overload. My office uses cohuman.com, which also has a priority system but applied to tasks. very cool. Thanks Om! As always, great information. This feature will come in very handy as my company has been using my gmail to keep in contact over here in Afghanistan. It has made my gmail into a nightmare. This should help. Agree it is a great new feature. That said Gmail is still missing the “High Importance” notification for outbound mails. I would also love them to improve their filters (set e label per email domain) and bring some wave functionalities. For a few days I have been using exchange POP3 support to retrieve all my mails into Gmail and use it as my default mail client. So far so good. I got the mails sync between my android phone and gmail, nice. This goes to show how much of an advantage the big G has with who knows how many employees, all or most of whom use their external tools internally, most of them able to come up with sensible suggestions for improvement, and enough of them to turn those wishlists into reality. Google just knows how to do it. Can’t wait to try this out! If it works, this is a great idea. You know, I have been trying the new priority inbox out and I think it works great. My only wishlist item is to be able to prioritize my different inbox tabs. For instance, the standard setup is Important and Unred > Starred > Important (I added this one) > Everything Else. I wish I could move those around because I want to keep my important ones on top and in view at all times. Does anyone else have this problem? I’m curious to use Gmail’s new Priority feature. Seems that Google worked on their spam-algorithms to predict the good mails. Priority Inbox is like Spam-inverse. This looks pretty darn useful. My only concern would be missing important stuff that gets routed to “Everything else”, but then I used to be worried that I’d miss stuff due to Gmail’s spam filter, and that never happens..
Simon, I have been using Priority Inbox as a Google employee for at least 6 months. It works great, and hasn’t lost anything important for me. Be sure to use the “plus” sign and “minus” sign at the top of each email message to tell Gmail what is important to you. The algorithm works really well, but your personal votes help it work even better. 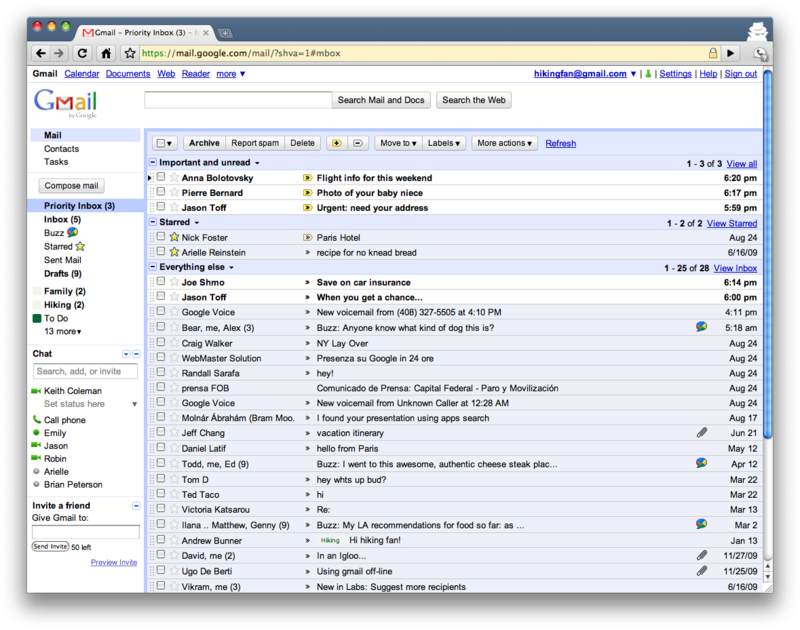 While I am not a fan of all the Google products out there, GMail is one of the few that I love working with. I almost wished I received more email so I could spend more time working within it and fine tuning it. I can’t wait for this feature to roll out for my account to play with. SO how do we get it ? It will roll out to all users over the next week. As it is in beta, you will have to enable it. Look for the red “New! Priority Inbox” link in the top right corner of your Gmail. Clicking on this will give you a short intro and let you turn it on. Enjoy! Any idea when Google will roll this into the main stream? Today in beta. The post does not mention when beta might expire. They are rolling it out as a “beta” feature to most of their customers over next few days. That is the extent of information I have for now.